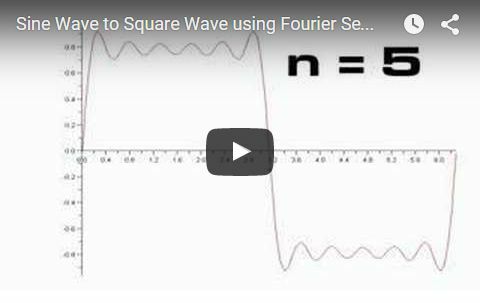 The Fourier Series is an infinite series expansion involving trigonometric functions. `(a_0)/2` is the mean value, sometimes referred to as the dc level. and then modify the series appropriately. It gives us the same final result. (c) it has a finite number of positive and negative maxima and minima. When these conditions, called the Dirichlet conditions, are satisfied, the Fourier series for the function `f(t)` exists. Each of the examples in this chapter obey the Dirichlet Conditions and so the Fourier Series exists. Find the Fourier series for the function. 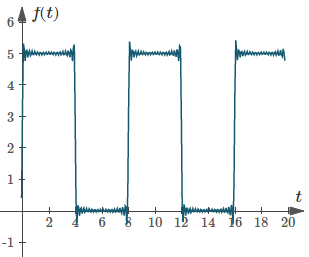 Interactive: You can explore this example using this interactive Fourier Series graph. Graph of `f(t)`, a rectangular function. We need to find the Fourier coefficients a0, an and bn before we can determine the series. Note 1: We could have found this value easily by observing that the graph is totally above the t-axis and finding the area under the curve from t = −4 to t = 4. It is just 2 rectangles, one with height `0` so the area is `0`, and the other rectangle has dimensions `4` by `5`, thus the area is `20`. So the integral part has value `20`; and `1/4` of `20 = 5`. Note 2: The mean value of our function is given by `(a_0)/2`. Our function has value 5 for half of the time and value 0 for the other half, so the value of `(a_0)/2` must be 2.5. So a0 will have value 5. These points can help us check our work and help us understand what is going on. However, it is good to see how the integration works for a split function like this. Note 3: In the next section, Even and Odd Functions, we'll see that we don't even need to calculate an in this example. We can tell it will have value 0 before we start. `=10/(n pi)`, if `n` is odd, and `0` if `n` is even. We also need to generate only odd numbers for the sine terms in the series, since the even ones will be 0. Let's think about what the answer in the above example means. Apart from helping us understand what is going on, a graph can help us check our calculations. The following video illustrates what we are doing. The equation is not exactly the same, but the concept is. The tone heard at the end is (close to) a "pure" square wave. If a function is defined in the range -π to π (i.e. period 2L = 2π radians), the range of integration is 2π and half the range is L = π. `f(t) = f(t + 2π)` for all `t`. b) Obtain the Fourier series of `f(t)` and write the first 4 terms of the series. 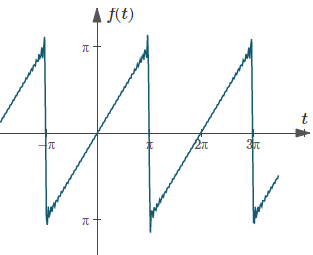 Graph of `f(t)`, a sawtooth curve. b) First, we need to find the Fourier coefficients `a_0`, `a_n` and `a_b`. We can express the Fourier Series in different ways for convenience, depending on the situation. In this case, our lower limit of integration is `0`. Let the function `f(ω)` be periodic with period `2L`.